The York House Water Gate, Embankment Gardens, New Year's Day 2012. 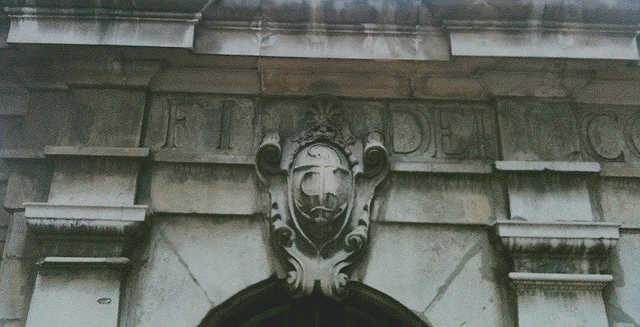 A 17th century Italianate arch lies 150 yards from the Thames, weather-worn and hidden between the office blocks. In its pomp a gateway for kings and courtiers, it marked the riverside entrance to one of Europe's most sumptuous houses. So how has it come to stand marooned in a park? And how did it survive the centuries? 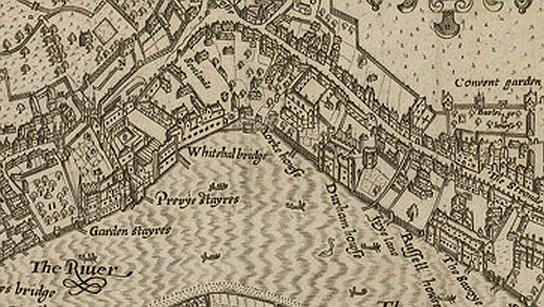 John Norden's 1593 map of Westminster. The pre-Watergate jetty at York House can be made out in the centre. The first section of the rambling Whitehall Palace to the left. The Strand is to the right. 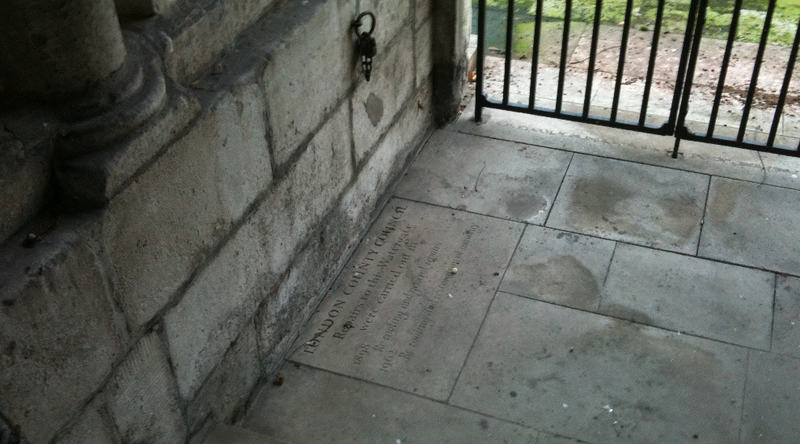 York House finally passed into Buckingham's possession in March 1622 as a condition of Bacon's pardon. Each of the neighbouring Strand palaces (such as Somerset House and Durham House) had river entrances to facilitate easy passage between Whitehall, Greenwich and other properties along the Thames. His aesthetic vision for the property demanded a river entrance of equal majesty, and it was he who ordered the construction of York House's last remnant visible today: the Watergate. At the time he took ownership Buckingham was the highest-ranking non-Royal in the country. The intimacy of his relationship with the king (James I) led to the 20 year-old being trusted as confident and advisor to James' son and reluctant monarch-in-waiting, the 22 year-old Prince Charles. Later in the year the two would travel incognito to Spain to conduct secret marriage negotiations for the hand of the Infanta Maria. This ill-fated trip may have been a political disaster, though Charles didn't come away entirely empty-handed. Amongst the gifts presented by the Spanish was the monumental sculpture Samson Slaying a Philistine (1560-2), by Giambologna. The closeness of Charles' friendship with Buckingham was reflected in his subsequent gesture: he gave the Giambologna to Buckingham as a gift, and it remained as a showpiece of his collection in the York House garden, reputedly the only piece on display not plucked from antiquity (a 1635 inventory revealed no fewer than 59 pieces of Roman sculpture there). The statue complemented the already formidable collection of paintings inside the house, including a large body of work by Rubens. The south-facing pediment. 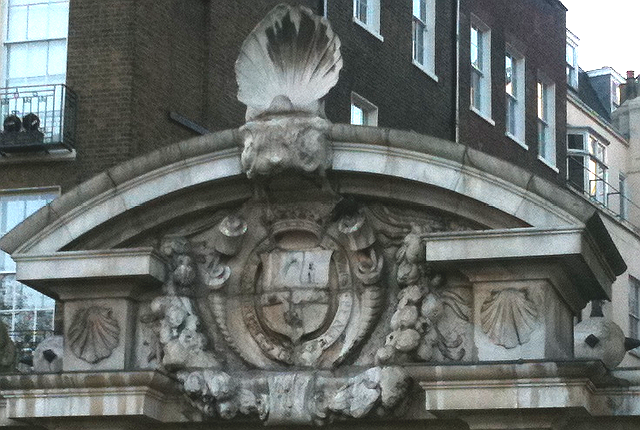 The escalopes (shell) motifs are taken from the Villiers coat-of-arms. Buckingham's military and political record might be strewn with failures, though his influence in kindling Charles' ambition to become a leading patron and collector in his own right was far more successful. A few years later Rubens himself would deem Charles "the best amateur of painting of all the princes in the world" - an apprenticeship part-served in the corridors and river gardens of York House. The Giambologna statue also survives. It's now in the Victoria and Albert Museum, and the story of its sequence of owners - both before and after it was at York House - is a worthy diversion in itself. You can read more about it here. The work of many hands? In 1623 Buckingham set about commissioning a dramatic river-front entrance to his grounds. 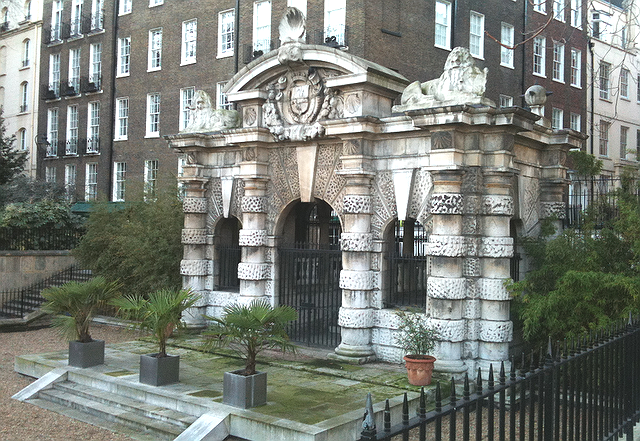 A striking Portland stone Water Gate in the style of Sebastian Serlio was ordered. Serlio's volumes conveying his Italian Renaissance style were already in circulation in Italian, and had been studied by architects and designs such as Inigo Jones. As Surveyor-General of the King’s Works Jones is often credited with being the first to bring the Italianate style to England. By the time the Water Gate was commissioned he had finished his work on the Banqueting House, and his hand was assumed in the design and construction of the Water Gate. He is, however, not the only only candidate. Since arriving in London in 1616 the designer and diplomat Sir Balthazar Gerbier had been acting as Buckingham's art buyer and collection manager. He had also accompanied Buckingham and the king on the ill-fated trip to Spain. Gerbier's letters to his patron in the Bodleian library document some of his involvement in the remodelling work of York House in the 1620s, and as such suggest that he may have been chosen for the commission. The final name in the frame is Nicholas Stone. It was thought that the sculptor and architect was involved in the Water Gate's construction using plans drawn up by either Jones or Gerbier, however comparisons of stylistic elements of other examples of Stone's work (such as the Doric banded columns) have given greater weight to his claim as designer and builder. 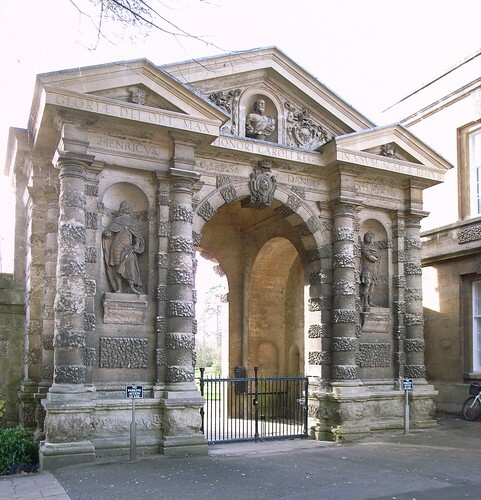 Stone had also studied Serlio and his rusticated style can be seen in the strikingly similar - though larger - Danby Gateway (above), one of the three entrances to the University of Oxford Botanic Gardens. Until more conclusive evidence comes to light it appears that Stone has the best claim to the Water Gate's initial design and construction, though either of the others - more probably Jones - had a hand in its refinement. A more detailed examination of the Water Gate's design - including a preparatory drawing attributed to Stone - can be read at the Sir John Soane Museum website, here. The Gate was completed in 1626, though Buckingham would enjoy it for only two years. In 1628 he was murdered in Portsmouth by a veteran of one of his disastrous naval escapades, angry at being passed over for promotion. The house was passed between family members and tenants until after the Civil War. 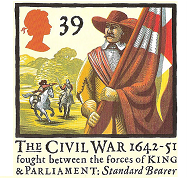 In 1644 parliament ordered the seizure of the property and its possessions. The "superstitious" art collection was to be taken and burned but was saved by the Earl of Northumberland - the tenant at the time - who stepped in and saved the majority of the work, claiming it would affect the future value of the property (though more likely was interested in securing the pick of Buckingham's collection for himself). In 1649 Cromwell conferred York House on Thomas Fairfax as recognition for his services during the Civil War. Buckingham's heir, George, the second Duke, had been living in exile with Charles II but returned in 1657. He married Fairfax's daughter, Mary, and was granted permission to live with her, thus returning York House to Villiers ownership. The Restoration would not, however, bring back the property's glory days. Buckingham's debts were growing unmanageable and in 1672 he sold the estate to developers for £30,000. His one condition was that the streets surrounding the land would be named in his honour. 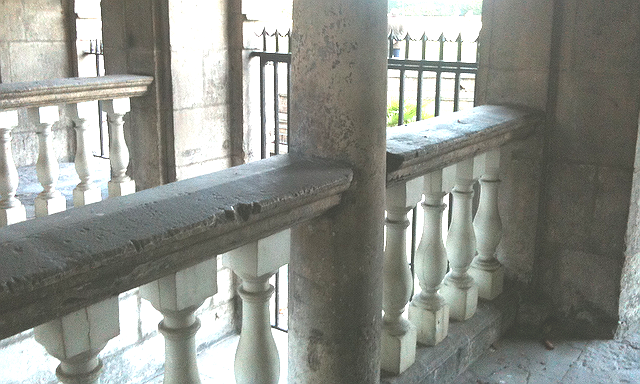 Looking through the balustrades across Embankment Gardens towards the Thames. By 1674 the estate was already being carved up by developers, with York House demolished in 1675. The work of generations of Lord Keepers and the First Duke of Buckingham was undone in a little over a year. At the same time the streets to the rear of the Water Gate (which exist to this day) were laid out, with the first of the new buildings following soon after. Seeing an obvious commercial opportunity for supplying water to the properties a group of investors established the York Buildings Waterworks Company. An obelisk-shaped water tower was built adjacent to the Water Gate - a landmark conspicuous in many 18th and early-19th century paintings of the north bank. The late-17th century land agreements also stated that a terrace walk be laid behind the new buildings to allow access to the Water Gate for those wishing to walk by the Thames. The river would lap at the steps of the Water Gate until 1862. In that year the engineer Joseph Bazalgette was commissioned to construct the Thames Embankment. The reclamation of 22 acres of marshy land for real estate would leave the Water Gate where it is today: marooned 150 yards from the water's edge. 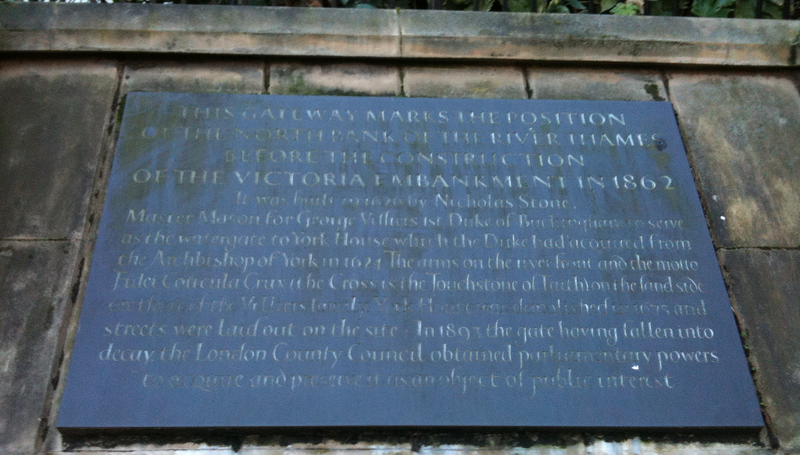 In 1874 the Embankment Gardens were created as a public space, though responsibility for maintaining the Water Gate was unclear, and by 1880 it had fallen into a sorry state. London County Council stepped in in 1893 to protect the Gate, carrying out general repair work and re-roofing in 1898. The roof was again replaced in 1962, with some masonry restored. The Gardens - with its Water Gate and other pieces of public art - are now looked after by the City of Westminster. building to Nicholas Stone alone. The Gate is locked and protected by a low fence, but the area around it is surprisingly accessible. Watergate Walk (separating the Gate from the steps to Buckingham Street) runs directly behind and allows close-up viewing of the Gate's interior. Tables and chairs from Gordon's Wine Bar, a popular venue for post-work drink, sit in its shadow. Though weathered, the Water Gate seems in a fair state of repair given its age. The main visitors to the gardens on weekdays are office workers eating their sandwiches. I doubt the Water Gate features on too many tourist trails given the detour required from more popular attractions like Trafalgar Square through the busy area behind Charing Cross station. Coaches drop off on the Embankment itself, and some groups may use the pathway through the gardens as a cut-through to the Strand and Covent Garden. As the Water Gate is set back beneath the trees it's also not immediately visible from the Embankment, and as such is pretty much hidden from passers-by. A shame, as with the Banqueting House a short walk away it's one of the few surviving reminders of London's 17th century Italianate court architecture. It's sad that this once famous landmark is hidden away. It's also a shame that none of the original house has survived..